The coastal zones and river mouths are very complex environments with diverse geomorphological, sedimentary, hydrodynamic and biological contexts: estuaries, deltas, bays, shelfs, rocky coasts with cliffs, beaches with sand (with dunes or not), gravel, pebbles or mud…, wetlands including coastal marshes, swamps. Because of their diversity, these environments are among the most productive ecosystems on the planet and they regulate the water flow and mass (i.e., nutrient, carbon, salt), filter pollutants and contaminants. Moreover, these systems are subject to widespread human use with high population density (high urbanization), and extensive harbor, industrial, and tourism activities, leading to important change of morphology, sedimentology, hydrodynamics and biology of these environments. Furthermore, these systems are among the most affected by climate change, with the sea level rise, and the increase of the storm surges & river floods that are already observed in many coastal regions of the world (IPCC, 2007, 2013). Thus, these areas are subject to multiple hazards: coastline retreat, inundation by river and storm surges, pollution. According to the OCDE, damage by the hydro-meteorological and marine phenomena in these areas in 2005 was estimated at US $ 3 trillion and could be multiplied by 10 in 2070. This shows the importance of accurate surveys of hydrodynamics, morphology, sedimentology at different time and space scales to better understand, predict and manage the evolution of these environments. The hydrodynamics of these environments are very complex, with many hydro-meteo-marine phenomena (offshore currents, wind-driven shelf circulation and waves, tides, storm surges, sea level rise and inputs from streamflow and groundwater) interacting at different spatial and temporal scales. The morpho-sedimentary and climatic contexts are very varied, so that the interactions of phenomena and their effects differ from one environment to another. In-situ measurement stations of water levels and the tide gauges are sparse and located in sheltered areas (such as harbours) and do not allow to study with precision the extreme events, such as storm surges. The modeling generally targets given regions and physical processes and requires a bathymetry with a very fine resolution to study the physical processes with a small scale. Remote sensing observations could provide critical information on the spatial variability of water surface elevations under different hydrodynamic conditions (Laignel et al, 2015). This would allow us to better understand and model the interactions between the different hydrodynamic processes, and their impact on the evolution of these environments. Over the last two decades, satellite radar altimeters, measuring sea level variations, have provided major advances in ocean dynamics (Fu and Chelton, 2001; Morrow and Le Traon, 2012), but encountered many problems in the coastal environments, resulting in a rapid degradation of the data accuracy when approaching the coasts. Moreover, nadir altimeter missions, such as TOPEX/Jason, have an inter-track spacing which limits their ability to map smaller-scale features in the coastal zone, such as shelf tides, coastal tides, the effect of winds and storm surges, etc (Arbic et al, 2014). The SWOT satellite (Surface Water and Ocean Topography; NASA and CNES mission, with CSA and UKSA contributions; launch in 2021) will offer new opportunities to survey the hydrodynamic in the coastal and estuarine zones because it will provide data on the water level with a high spatial resolution (oceans: 1 km, rivers: 100 m of width) and an excellent global coverage. The main objective of the COTEST project (Caracterisation, modeling and SWOT potentiality to measure hydro-meteo-marine phenomena in the coastal and estuarine systems) is to better understand the interactions of the hydro-meteo-marine phenomena on the hydrodynamics in the estuarine and coastal systems (nearshore and shoreline) and SWOT ability to reproduce this hydrodynamics and these phenomena. In this project, there are 18 teams: 12 French teams, 2 European teams, 2 North American teams and 2 African teams (M2C & IDEES Rouen, LETG Caen, LDO Brest, EPOC Bordeaux, LEGOS-GET- CERFACS Toulouse, SERTIT Strasbourg, MINES ParisTech, LNHE, I-SEA Bordeaux, JPL Pasadena, Bedford Intitute, Univ. Berlin, Univ. Cantabria, INRGREF Tunis, Univ. Thies). To calibrate and validate SWOT from airborne campaigns (AirSWOT and LIDAR). Sixteen coastal and estuarine sites were selected in different tide contexts (macro, meso and microtidal), diverse morphologies (estuary, delta, bay, coast with sandy beaches or cliffs) and different climates (temperate, mediteranean, tropical, arctic) (Fig. 1). 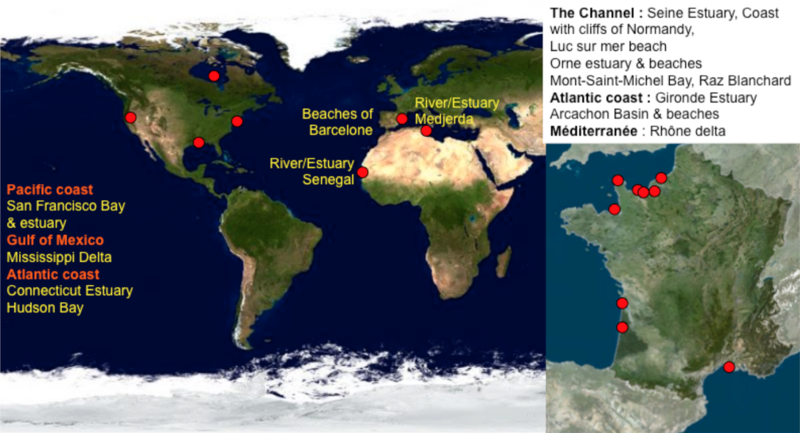 The sites are located mainly in France along the Channel, Atlantic and Mediterranean coasts, but also in US and Africa. The project is based on 4 approaches. To study the capacity of SWOT and the effect of its revisit (number of overpasses) to restitute the temporal hydrological variability, we simulate SWOT data without error and with white noise: we sample the time series of water level or discharge during 4 or 5 years according to the passage frequency of SWOT. Then, we characterize and compare the temporal hydrological variability of the in situ and simulated SWOT data from statistical and signal processing methods (trend, loess, PDF, CDF, wavelet analysis...). Figure 1. Studied sites in the COTEST project. The second approach is the combining of the modeling and HR and LR SWOT simulator. We use T- UGOm, DELFT-3D and TELEMAC models to accurate modeling of the spatial and temporal variability of water level and the models data are used as input data of the HR and LR SWOT simulator in different hydrodynamic conditions (Neap tide/Spring tide,High/Low tide, with or without storm surges for Coastline, and Neap tide/Spring tide,High/Low tide, high/Medium/Low discharge for estuary). This approach allows to study the SWOT ability to reproduce the spatial hydrological variability in different hydrodynamic conditions. The third approach consists to the comparison of the SWOT potentiality with the other satellites in the coastal and estuarine environments. We use optical imaging with high resolution such as Sentinel 1 and 2 (20 and 10 m) and altimetry with Topex/Poseidon, SARAL and SAR altimeters (ex: Cryosat-2, Sentinel 3A et 3B, Jason-CS, TerraSAR-X). The comparison between the altimeters data and in-situ data (tidal gauges) allow to estimate the performance of these altimeters to monitoring the physical processes in the coastal zones. Then, from the characteristics of these altimeters and those of SWOT, we estimate the SWOT performance in the coastal and estuarine zones. The fourth approach is the analysis of the AirSWOT and LIDAR airborne campaigns. We will analyse the AirSWOT campaign in the Mississippi delta in collaboration with the JPL. Moreover, we carried out and will perform several LIDAR campaigns in the Seine estuary and along the coast of the Channel. The aims are to distinguish the diferent objects (water, sand, vegetation…) and to characterise the water roughness. Then, the lidar pictures will be degraded at the SWOT resolution and will be compared with SWOT simulator data. A best reproduction by SWOT in microtidal (wavelet coherence = WC: 73-90%) than macrotidal contexts (WC: 50-87). A decrease of the reproduction by SWOT from river and upstream estuary (WC: 87-90) to downstream estuary and coast (WC: 50-82). 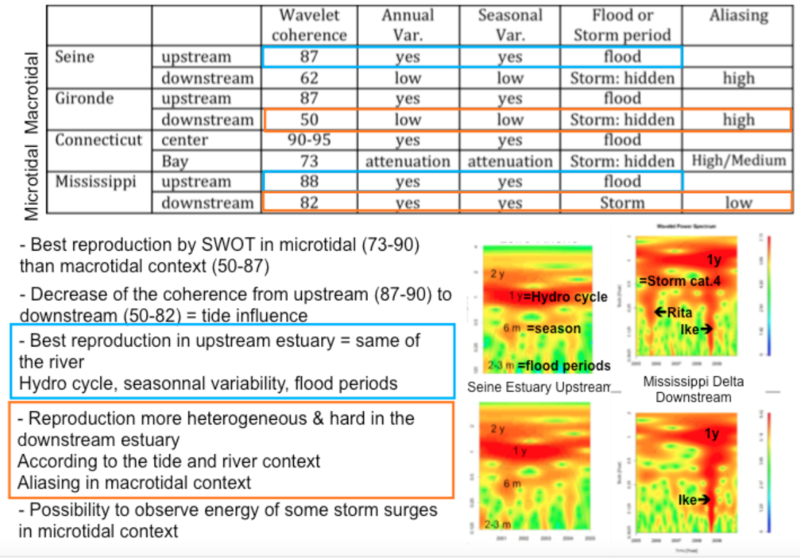 SWOT reproduces well the main hydrological variability patterns in the river and upstream estuary/delta (1y = hydrological cycle, 1,5-3 months = flood period). For the downstream estuary and the coastal zones, there is an aliasing effect between the passage frequency (number of overpasses) of SWOT and the ter-diurnal components of the tide (mainly M3), mainly in the macrotidal contexts (Turki et al, 2015a, 2016). After the filtering of these tide components, SWOT may be able to record the storm surges period (not all the storm surges but certain storm surges). Figure 2. SWOT ability to reproduce the temporal variation of the sea level in the coastal zones and aliasing phenomenon in different tide contexts. Figure 3. SWOT ability to reproduce the temporal variation of the water level in the estuaries/deltas in different tide contexts. 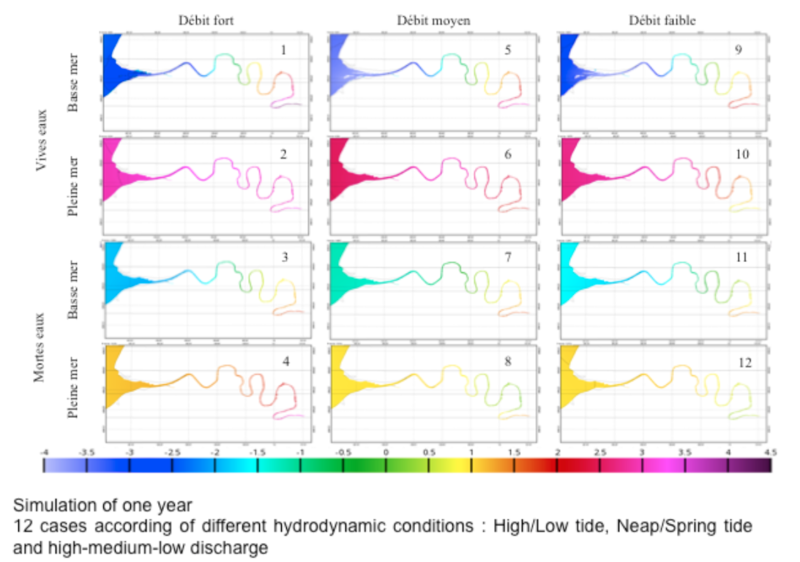 Regarding modeling, we simulated the water level during 1 year in the Seine and Gironde estuaries (with T-UGOm model, Chevalier et al., 2016) and we extracted 12 hydrodynamic scenarios by combining tide and river flow (high and low tide; neap and spring tide; low, medium and high discharge) (Fig. 4). The water level maps obtained by modeling in the Seine and Gironde estuaries show that the water levels are spatially highly variable in different hydrodynamic conditions and also in the precise hydrodynamic condition (ex: difference of 8 m between the upstream and downstream of the Seine estuary, along 160 km). This shows the importance of the high spatial resolution of SWOT to see these transitions in these environments. The T-UGOm model data were used as imput data in the SWOT simulator HR. The first test showed that the majority of the SWOT measure points are located in the channel and with low water level error, but some are outside and the error can be plurimetric for points outside or on the edge of the channel, because of the thermal noise and the layover. 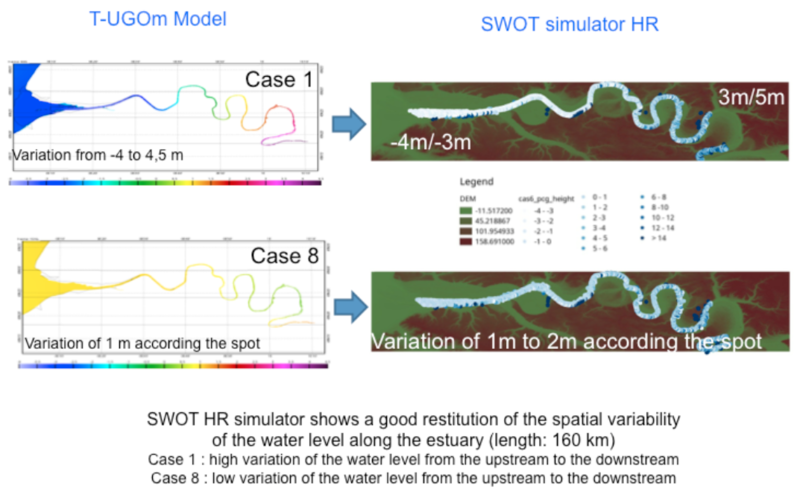 After correcting the simulator data with the improved geolocation method (Desroches method date thèse), the SWOT simulator HR gives good results: the SWOT HR simulator shows a good restitution of the spatial variability along the estuary (from the upstream to the downstream) in the different hydrodynamic conditions (combining different tide and flow conditions). We modeled also the sea level, wind, waves and currents in the South of the channel and Normandy coast by using DELFT 3D Flow and SWAN (Turki et al., 2015b). We simulated different scenarios in medium and extreme (storms) energy conditions in 2013, 2014, 2015, 2016. The results show that the best resolution to observe the energy structures and their variability is 250m, and thus the SWOT resolution of 500m (LR) and 100m (HR) will be adapted to observe the sea level, waves and currents in the medium and extreme hydrodynamic conditions in the coastal zones. Figure 4. Hydrodynamic modelling by T-UGOm in the Seine estuary. Figure 5. SWOT simulator HR in the Seine estuary. Because of its high spatial resolution and excellent global coverage, SWOT SAR-interferometric altimeter will be able to resolve the problems of the conventional altimeters in the coastal zones and will provide fundamental data to map the spatial variability of water surface elevations under different hydrodynamic conditions and at different scales (local, regional and global), to validate and calibrate our models (SWOT data assimilation in models), and thus to improve our knowledge of the complexity of the physical processes and their interactions in the coastal and estuarine systems. Arbic B.K., Lyard F., Ponte A., Ray R.D., Richman J.G., Shriver J.F., Zaron E.D., Zhao Z., 2014. Tides and the SWOT mission: Transition from Science Definition Team to Science Team. Chevalier L., Laignel B., Turki I., Lyard F., Allain D., Blumstein D., Desroches D., Fjortoft R., 2016. Hydrodynamic modeling for the Seine estuary: input data for the SWOT HR (Surface Water and Ocean Topography High Resolution) simulator. 5th International workshop on Multi-scale (Un)- structured mesh numerical Modeling for coastal, shelf, and global ocean dynamic, September 27th to 30th, Toulouse. Desroches D., 2015. Extraction de hauteurs d'eau géolocalisées par interférométrie radar dans le cas de SWOT. PhD thesis, Univ. Toulouse, 234 p.
Fu L.-L., and Chelton D.B, 2001. Large-scale ocean circulation. In: Satellite Altimetry and Earth Sciences: A Handbook for Techniques and Applications. Academic Press, San Diego, edited by L.L. Fu and A. Cazenave, 423, 133-16. IPCC (Intergovernmental Panel on Climate Change), 2007. Impacts, Adaptation & Vulnerability, Cambridge University Press, Cambridge. IPCC (Intergovernmental Panel on Climate Change) GIEC., 2013. Changements climatiques en 2013, Les éléments scientifiques, résumé à l'intention des décideurs, service d'appui technique du groupe de travail I GTI, https://www.ipcc.ch/report/ar5/wg1/docs/WG1AR5_SPM_brochure_fr.pdf, 34. Laignel, B., N. Ayoub, F. Birol, S. Brown, Y. Chao, B. Cornuelle, S. Costa, P. De Mey, C. Estournel, F. Feddersen, S. Giddings, S. Gille, A. Kurapov, F. Lyard, R. Morrow, M. Simard, T. Strub, I. Turki, 2015. Issues and SWOT contribution in the coastal zones and estuaries. White Paper, Science Definition Team SWOT. Laignel B., Turki I., Chevalier L., Lyard F., 2016a. Potential use of the SWOT satellite to characterize the hydrodynamics of the French rivers, estuaries and coasts. ESA Living Planet Symposium 2016, 9- 13 May, Prague. Laignel B., Chevalier L., Turki I., Lyard F., Soloy A., Gevrey J., 2016b. Potentialité du futur satellite SWOT pour l'étude de l'hydrodynamisme des systèmes fluvio-marins. Conférencier invité, 4ème Colloque international du réseau "Eaux & Climats" - Changement global et Ressources en eau: Etat des lieux, adaptation et perspectives, 12-13 Oct 2016, Fès. Morrow R. and P.Y. Le Traon, 2012. 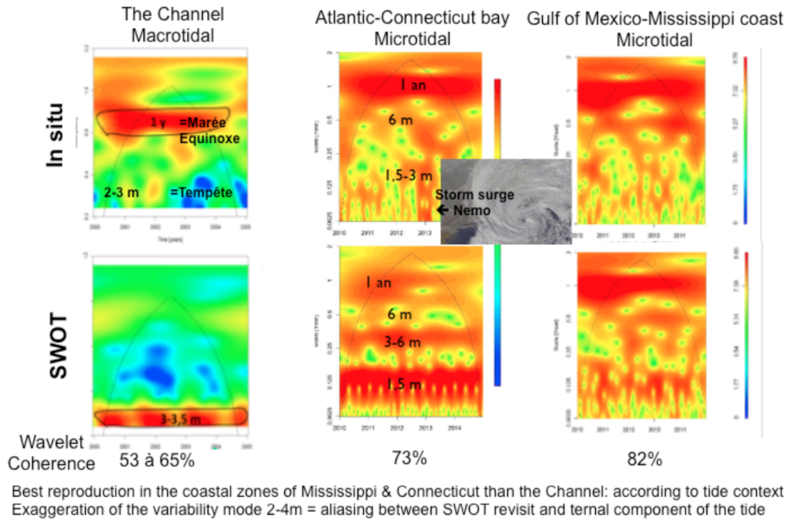 Recent advances in observing mesoscale ocean dynamics with satellite altimetry. Advances In Space Research, 50(8), 1062-1076. Turki, I., Laignel, B., Chevalier, L., Costa, S., Massei, N. 2015a. Coastal Sea Level Changes in the Southeastern Side of the English Channel: Potentialities for Future SWOT Applicability, Journal of Selected Topics in Applied Earth Observations and Remote Sensing, 8, 4, 1564-1569, DOI: 10.1109/JSTARS.2015.2419693. Turki, I., Laignel, B., Kakeh, N., Chevalier, L., Costa, 2015b. A new hybrid model for filling gaps and forecast in sea level: application to the eastern English Channel and the North Atlantic Sea (western France), Ocean Dynamics, DOI 10.1007/s10236-015-0824-z. Turki I., Laignel B., Le Bot S., 2016. A future insight to coastal zones by the use of SWOT satellite mission. ESA Living Planet Symposium 2016, 9-13 May, Prague.